After configuring my Linux Mint for a few hours, I have finally got it to run perfectly on my laptop. i am enjoying it so much already. Goodbye Ubuntu, may you have a long rest. Hello to Linux Mint. The new kid on the block, and its ready to take on the big guys. Dramatic eh? Anyhow, I would like to share my desktop for you guys to admire. It's a compilation of different tweaks and themes mashed together topped off with a BRS wallpaper. I like! By the way, I am using 'Hope-DT' as my Shell and Window theme. The icon theme is Faenza-Cupertino and the stats bar is Conky with 'Reloj Conky' theme. Just do a search for them in Google if you want to download and install. Basically, I got most by themes from gnome-look.org. 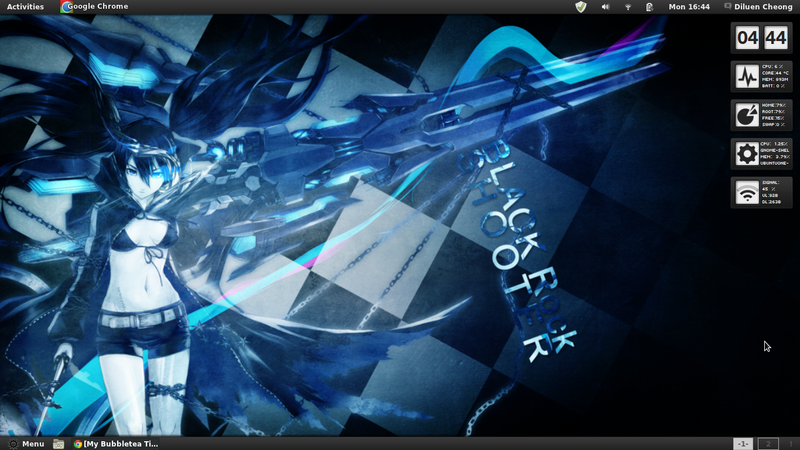 Oh by the way, seems like my 'Black Rock Shooter' theme for Google Chrome is getting popular with nearly 150 weekly users! So happy about that. Although I should fix up some minor issues, I'm sure this is still the best theme I've created yet. EDIT: It seems I left out my desktop icons. Due to some bug in Conky that would make the home icons disappear, I seem to have fixed it.